There are currently over 200 Firefighters registered to attend. We still have a few spots available and looking to sale out soon. If you have already registered and plan on staying on the beach, reserve your room ASAP. The Hilton has already added rooms to our conference allotment and is close to filling up. The current rate using the code PHR is $90 a night for a Sound side double. They do have one, two, and three room suites available for larger groups. If you choose the Command Track at the Conference, you DO NOT NEED GEAR. If you choose the minimal hands on, you will need work gloves and duty boots. There will be 55 slots available for the FULL Hands-On and this will require FULL BUNKER GEAR. We will have 30 SCOTT Air packs available for individuals that are flying. You need to confirm your FD approves your attendance at the HROC 2013. There will be a Conference Sponsored Gathering each night of the conference and all attendees are encouraged to attend for additional educational sharing/networking. We will provide transportation from airport to the Hilton on Sunday afternoon December 1 and transportation back to airport on Thursday morning December 5. Opening Ceremonies will start at 0800 on Monday morning December 2. Monday and Tuesday is Full Day Lecture Seminar with four different speakers each day. Hands-On and Command Track will be on the third day “Wednesday December 4”. You will fill out request form on the first day, to determine your track for Wednesday. The Conference will end on Wednesday at 1800 hours. There will be a roundtable on Wednesday evening for the attendees staying at the Hilton. We highly encourage Senior Officers to take the Command Track. 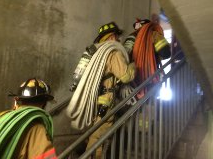 Click On Link Below for Flyer..
A husband and his wife are attempting to snake out the basement floor drain. The husband sees some debris enter the back of the drain, he instinctively sticks his hand down there to clear the debris just as his wife turns the snake on. The snake impales the mans hand and pulls his arm into the drain causing his hand and arm to become stuck. This exact scenario has played out to a couple of friends of mine from 2 different departments, and you can see how this could easily happen again. Picture of actual snake and pipe that a mans arm was extricated from. I wanted to try to recreate this scenario in training, I thought it was a great scenario and it gave you multiple materials to cut. So I set out to build a fairly cheap prop to reenact this rescue scenario. I built a small box out of old wood that I had laying around, this would act as a form for the concrete that I was going to pour in it. 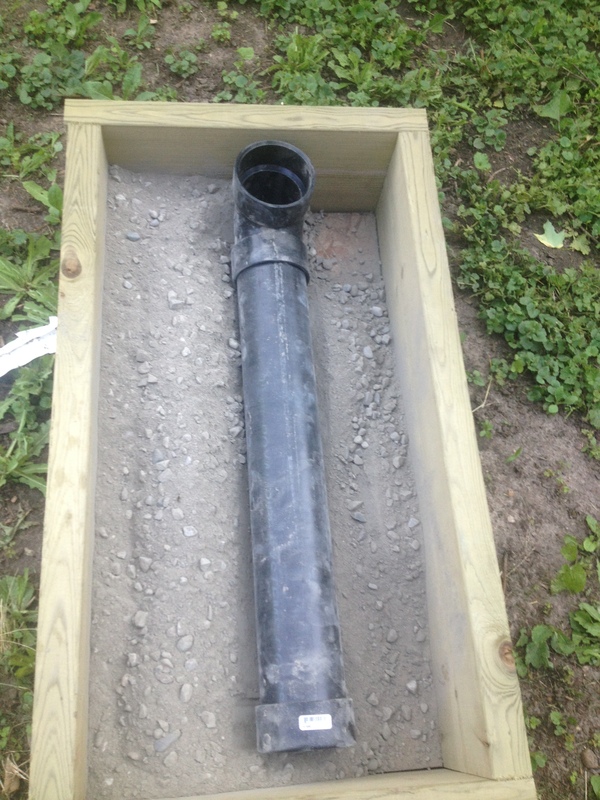 I also used some left over PVC pipe that I had to make a section of drain that the arm would be stuck in. 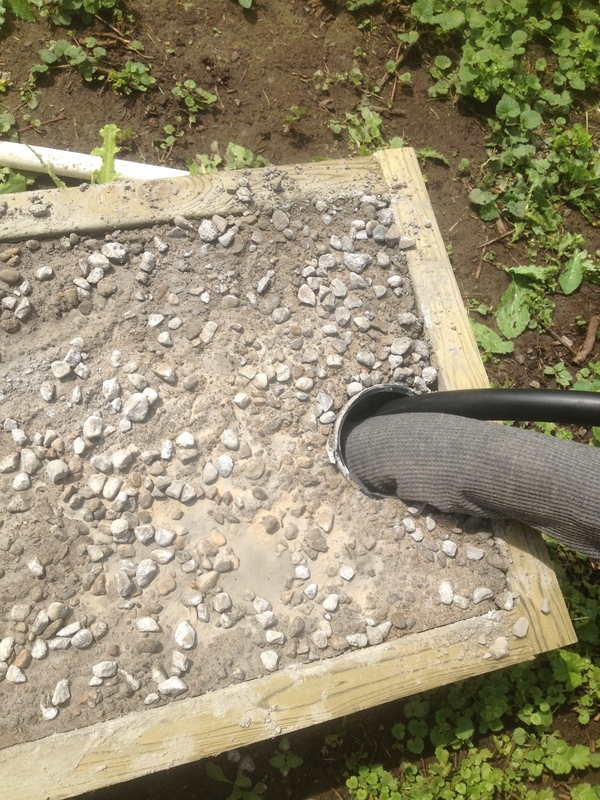 Once the PVC pipe was in place and capped the form was filled with a couple bags of quick dry cement. After the cement is dry it was time to build the arm and auger. I use the foam in the glove trick from our previous post. I used a small spring epoxied on the end of a old hose to act as the snake. Once the finger was wrapped up in the snake I put it into the drain pipe and we were ready to drill. To start the scenario we talked about medical considerations ad we also discussed non evasive solutions we could do (soapy water, etc). 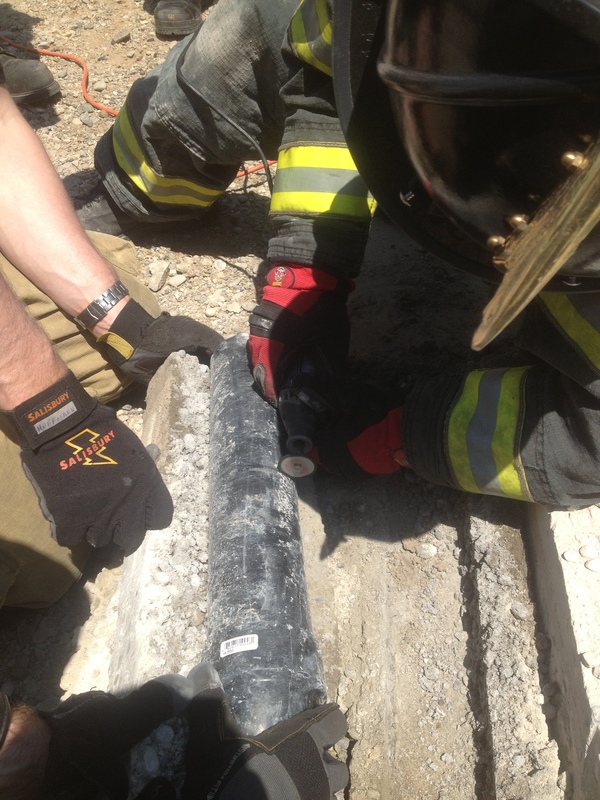 Then it was down to the extrication, we used a Partner saw with a diamond blade to cut the concrete and the pipe out. Once we had all the concrete broken off the pipe we used a Dremal tool to dissect the pipe, a multitude of other cutting tools could be used for this operation but we chose to stick with the Dremal tool for this drill. We used old hacksaw blades for hard protection from the saw blade. The Dremal worked extremely well at cutting the PVC, another tool that could possibly be used is a PVC Wire Cutter. 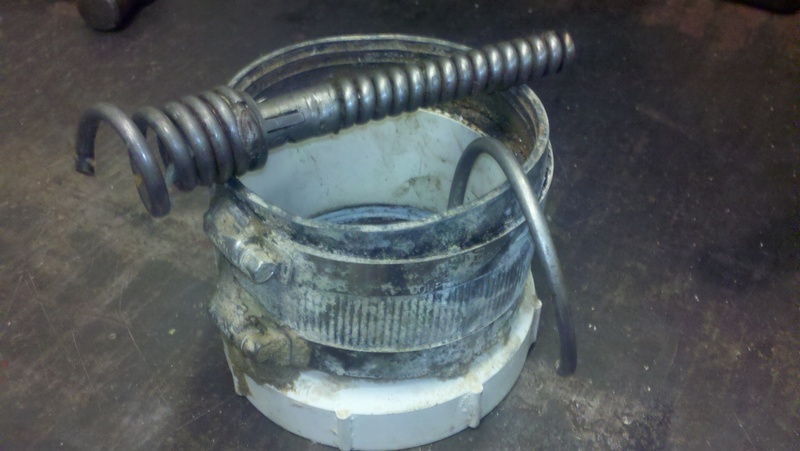 Once the arm was free from the pipe we needed to cut the metal spring that acted as the snake, again the Dremal was used but far more accurate cuts were needed. A mix of some modified spoons and some old hacksaw blades were used to act as hard protection to protect the patient. All in all it was a great drill to show several different types of material in one scenario. 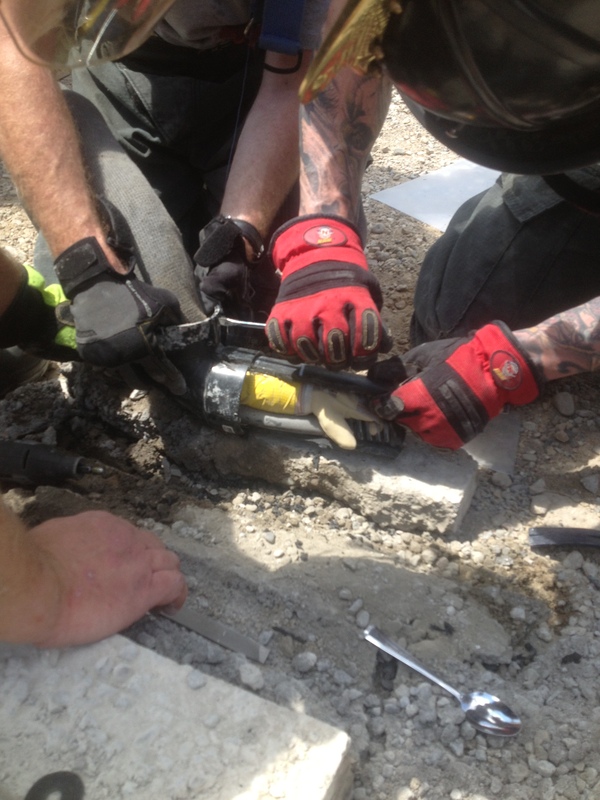 Use your imagination and push your training to the next level, you may never go to an extrication like the one we described in this drill but it will help build a tremendous set of skills that you can use in other types of extrication calls. 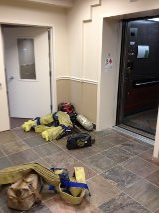 I think most people would agree that company level fire training is the back bone of our great profession, it is the day to day stuff that you drill on with your crews that has the biggest impact on our efficiency and effectiveness on the fire or rescue ground. So what are we looking for in a company level drill? Well for me it needs to be realistic, hands on, easily repeatable, and it does not require 4 hours of set up time. 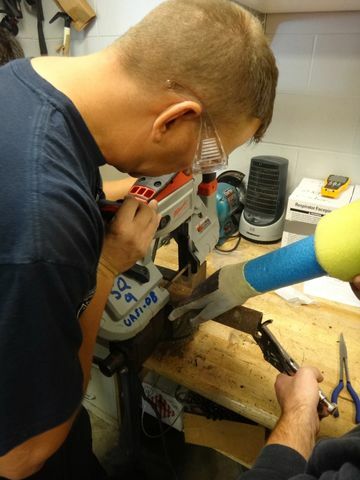 One of the little props I came up with for machine rescue training is a way to make cheap limbs that we could use to get entangled in different pieces of machinery that we could find. Using the typical rescue mannequin hands was usually a little to difficult due to the hand not bending or reacting like a real limb. 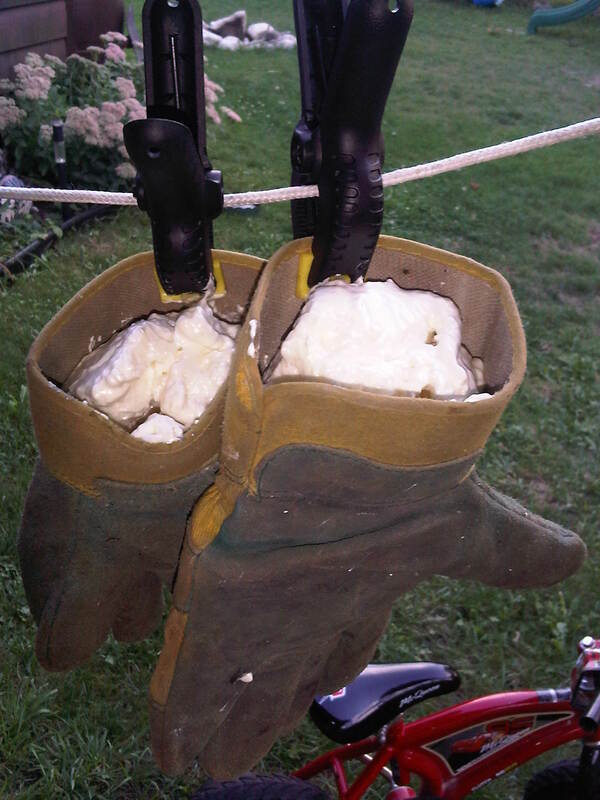 An easy prop that you can build at the firehouse for under $10 is take an old pair of work gloves or fire gloves and fill them with expanding spray foam (the type you use for insulating around doors and windows). Simply spray the foam into the glove, be sure to get it down into the fingers and only fill the glove up halfway. Hang the gloves up on a clothes line to dry and expand. Once the foam is dry you can use a serrated knife to trim the access foam from the top of the glove. 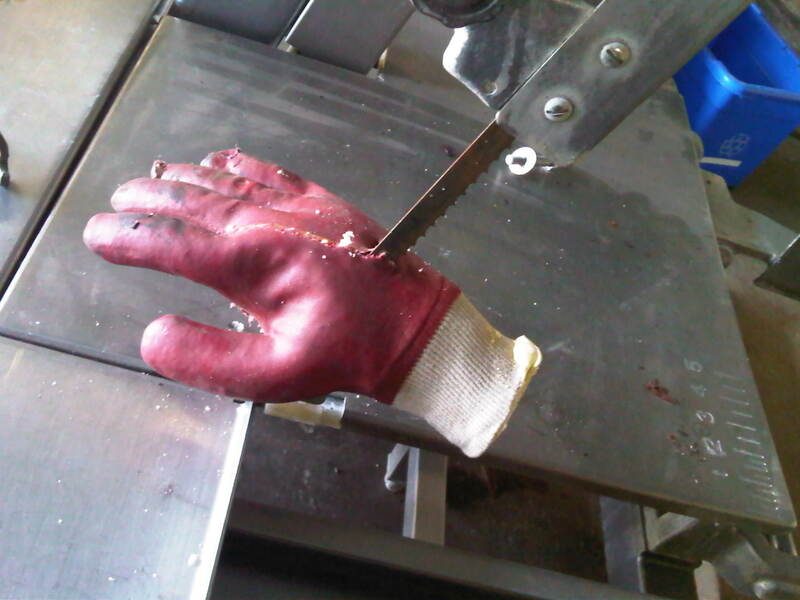 What you end up with after the foam dries is a firm, flexible, realistic hand that you can use several times for anything from machine rescue to impalement drills. 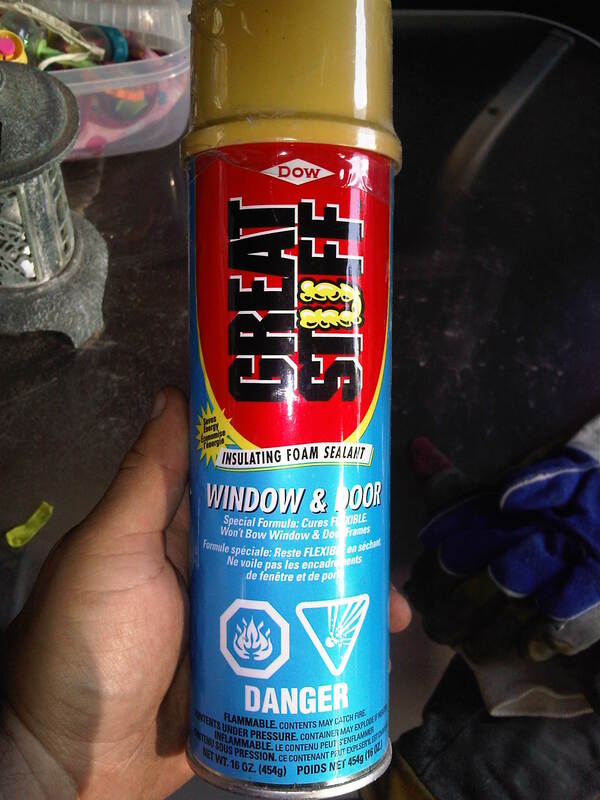 It works great and is extremely cheap to do. If you are looking to add even more realism to the prop you can also add an arm to the prop. 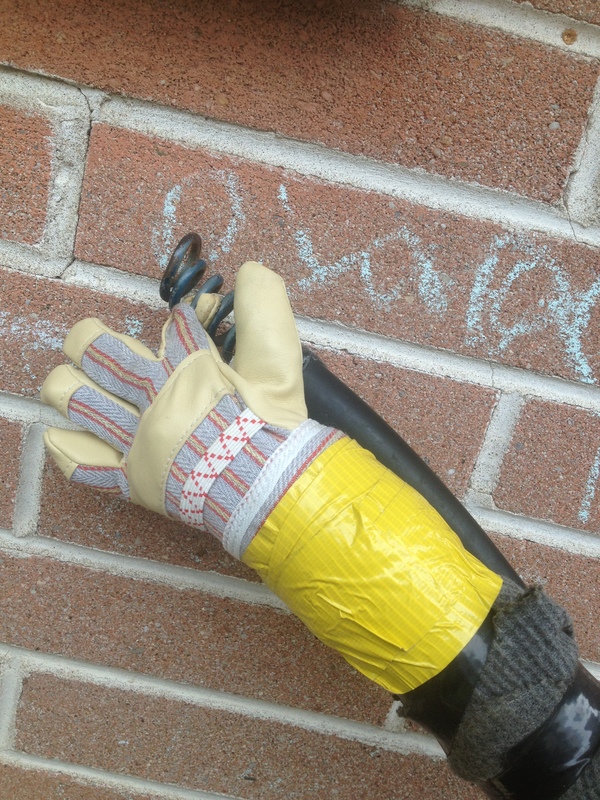 To add the arm take a pool noodle and insert it down into the wet foam and then add some additional foam around the pool noodle, when the foam dries it will have “cemented” the noodle into the glove. Adding the arm works great if you want to entangle it into a lawn mower, snow blower, some rollers, etc. You can also make a quick and easy leg the exact same way, simply take a shoe or boot and fill the toes with foam and then stick the pool noodle down into the shoe and fill the foam all around it. 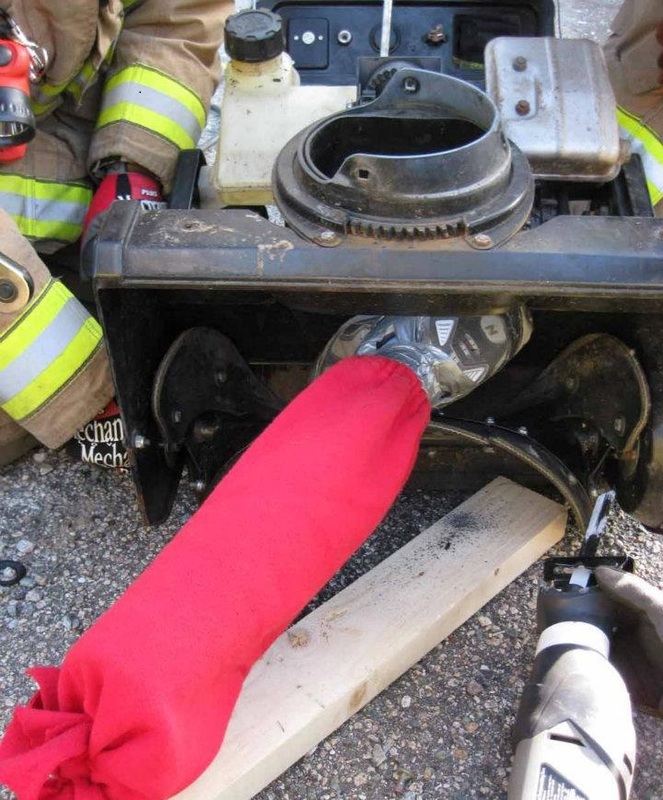 To make it even more realistic you can add clothes to the leg to make the rescuer have to cut the clothing away from the machine also. This is a simple, cheap, easy way to make props that will help you out a ton with your in house training. 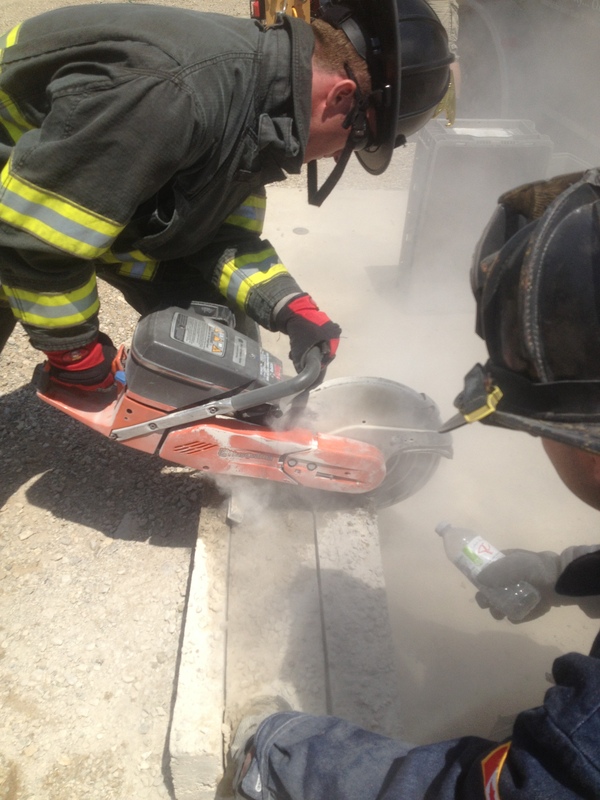 Tom Brennan use to say that allot could be told about the care and maintenance of ones forcible entry tools, is that true? 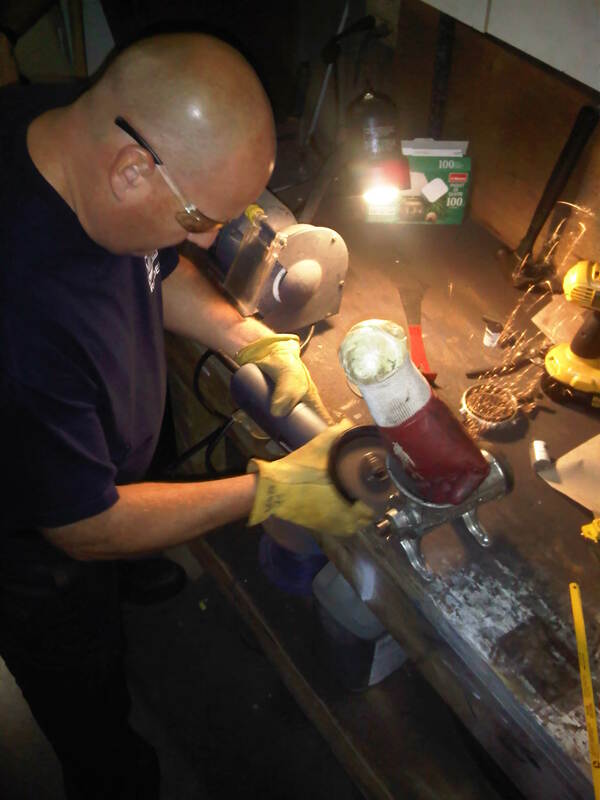 How important is the maintenance of your tools? 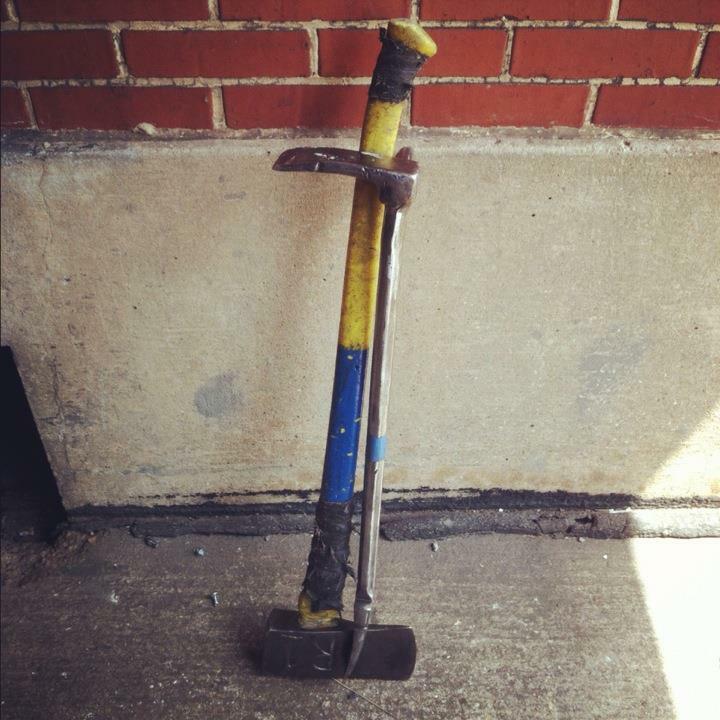 What type of maintenance do you do to your tools? Hilton Pensacola Beach Gulf Front currently has 20 rooms at $90 a night for HROC 2013. The Code is PHR. Please book room ASAP. 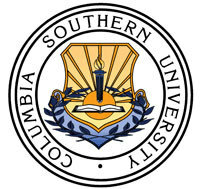 Once the 20 rooms have been reserved, they will evaluate authorizing additional rooms at this Great Price. They also have suites for a reduced price. When do you take the stairs and when do you walk? Answer is not just as simple as the SEVENTH. Things have changed. Where do you stage equipment? Have you reviewed the past, so you can learn from others? 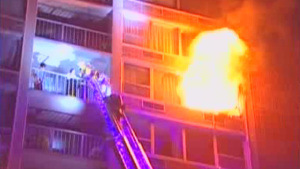 A Working High-Rise Fire will most likely be your most challenging fire. A fully sprinkled HR does not guarantee you will not have a Fire. 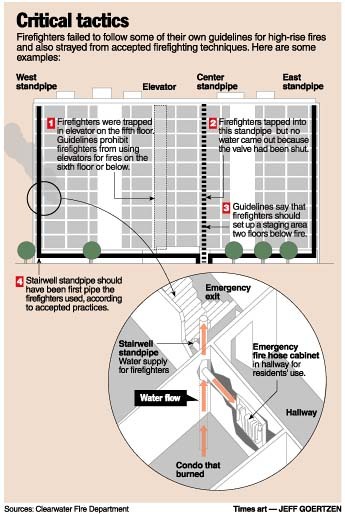 Sprinkler Systems do FAIL and then it will be an even Bigger challenge.